How to Apply Loan against Mutual Funds or Financial Securities? Home » Mutual Funds » How to Apply Loan against Mutual Funds or Financial Securities? Loan against Mutual Funds or Financial Securities is one of the ways to fulfill your financial need without liquidating your assets. You can borrow money against securities such as mutual funds, shares, insurance policies etc. The process of getting a loan against financial securities is fast and assured. You can get a loan for all types of funds like equity, debt, hybrid or liquid funds. However, it is recommended to go for a loan against equity mutual funds. Banks or NBFC charges 11-12% interest rate against borrowings. You can expect 60-70% loan against the market value of financial securities. 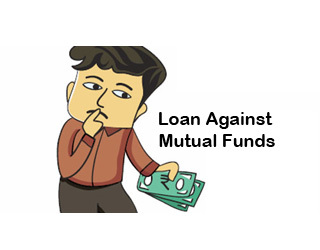 In this post, we will try to understand the process of getting a loan against mutual funds. How to Apply Loan against Mutual Funds? You can apply for a loan against mutual funds or financial securities in almost every bank or NBFC. Few banks also offer this facility online. You need to log on to the website of bank or NBFC. Fill up the application form mentioning mutual fund unit folio, scheme name and other details. Get approval of the loan. You need not to provide any guarantor or collateral for availing this types of loan. If you holding mutual funds or securities in demat form, the sanction and disbursal of loan is faster. If it is held in the physical format you need to enter into loan agreement and submit physical documents. Bank or NBFC from where you want to avail loan facility contacts Karvy or CAMS to mark a lien on the number of units applied for a loan. Once marking of lien is completed bank or NBFC lends the amount. Please note that you cannot sell lien fund units. Lien of fund refers to the right of financer to hold or sell the mutual funds in case fund holder default against the loan. Once you make payment of loan bank or NFBC will send a letter to Karvy or CAMS for removal of lien. The lien removal request contains folio number, scheme, and unit held. Lien can be removed completely or partially. A partial lien removal can be done in case you do part payment of a loan. The process of availing loan against mutual fund is very fast. Guarantor or Collateral is not required for this type of loans. The interest rate is less compared to personal loan 11-12%. You can do pre-payment of loan anytime. You can close this loan by making payment of the entire loan. Default in payment for multiple times may lead to enforcement of lien. You can get up to 60-70% loan against the market value of mutual funds. Loan against mutual funds is a very good alternative to personal loan or loan against gold. This loan option is advisable only if you are looking for a short-term loan. It is just like overdraft facility for the short term monetary requirement. It is secured loan so interest rate will be lower. The application process is easy and hassle-free. However, you need to be sure that you will be able to pay this loan on time. Default in payment may lead to enforcement. If you have any queries related to loan against mutual funds please post in the comment section. I will surely answer it. Note – Please check for the charges such as loan processing charges, foreclosure charges, late payment fee etc. before you avail such loan. Digital Loan against Mutual Funds (LAMF) – Should you opt?